Google continues adding new features to AdWords. “Enhanced Ad Sitelinks,” “Offer Extensions,” and “TrueView” video ads are three examples. I have tested each of these, and recommend them to merchants. Online retailers who use them first can start profiting before their competitors. The table below represents some of my initial observations. Impact on Click-Thru Rate. Indicates the impact on click-through rates when this feature is enabled. Impact on Page Real Estate. Measures how much more space on the page your ad will consume. Ease of Implementation. Level of difficulty in enabling and testing this feature. Here to Stay? My prediction on whether this feature will remain active over the long-term. According to Google, the average increase in click-through rates when Sitelinks are enabled is 30 percent. Google apparently expects to build on that success with Enhanced Ad Sitelinks, which it announced in its blog on Feb. 14. As Google described in the blog post, Enhanced Ad Sitelinks will look something like the following. Enhanced Ad Sitelinks incorporates additional ads from your account. Enhanced Ad Sitelinks dynamically incorporate text from other relevant ads in your account. The on-page real estate that your ad consumes increases substantially, which can lead to increased click-through rates and more visibility for your brand. How to implement. To use Enhanced Sitelinks, you must be using Sitelinks within your AdWords account already. Your account must also contain active ads that are closely related to those sitelinks in your campaign. If you aren’t using Sitelinks and want to learn how to start, visit the AdWords Help Center. Initial results from campaigns we manage. The results have been strong so far. In the short time we have used Enhanced Sitelinks, we have seen a material improvement in our clients’ click-through rates for the primary ad in question. Offer Extensions give you extra room within your ad to promote timely offers, rebates, and promotions. They are available now on a limited release. However we have tested them for many of our clients. Here is an example of what an Offer Extension looks like. Offer Extensions facilitates time-sensitive offers in your ads. Shoppers who click on “view offer” go to a page on your site that explains the offer. In addition to driving sales directly, merchants can use Offer Extensions to gain insights into which offers resonate with target customers the most. For example, you can see which offers generate the most clicks. Where the shopper can redeem the coupon. Initial results from campaigns we manage. Offer Extensions are worthwhile if you are looking to reach interested, potential customers with your deal. So far, however, we’ve seen only a slight improvement in click-through rates. TrueView video ads are now available through AdWords in limited release. They allow you to place video ads on YouTube and other sites in the Google Display Network on a cost-per-view basis. That means you only pay when someone clicks to watch your video. 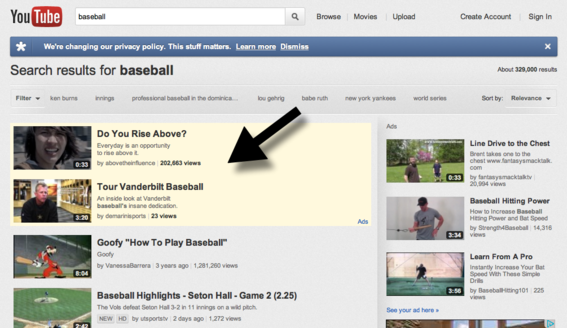 Here is an example of where your TrueView ads may be placed when a user performs a search on YouTube. TrueView lets you show targeted video ads for specific searches. Normally video ads such as these have a strong brand impact, but result in low click-through and conversion rates. So far, however, Google states — and I’m inclined to agree — that these ads can produce click-through rates and conversion rates that are in line with standard search advertising performance. Such strong results are possible because these ads are served to viewers for whom the video content is relevant. How to implement. First, you must create video content to promote. Then, to use TrueView ads, click on the “Campaign” tab in your AdWords account and select “Create New Video Campaign.” From there, follow familiar steps, like campaign name, budget, and language. Next, select your video and your format. For more help, visit AdWords Help. Initial results from campaigns we manage. We have observed click-through rates over 1 percent so far, which is good given that this format is young and best practices have yet to emerge. We think TrueView ads are worth trying. We suggest the following tips. Use short advertisements. Use video advertisements that are 30 seconds or less to keep viewer interest. Target your audience. Use appropriate keywords, topics, demographics, and interests. Determine video settings. Make sure your video shows in appropriate settings: in-stream, in-slate, in-display, in-search. “Enhanced Ad Sitelinks,” “Offer Extensions,” and “TrueView” video ads are worth trying. All three are relatively easy to implement. They can help you improve your return on investment, brand awareness, and click-through rates. While they won’t work for all merchants, you’ll gain a big advantage if you find that they work for you early on. You’ll be able to scale the use of these features and formats within your campaigns before many of your competitors catch on. Cheaper Clicks from AdWords Coming?